Remembrance Sunday is approaching and poppies are on sale to raise money for the Royal British Legion. But what is the etiquette when it comes to wearing one? Worn to remember the nation's war dead, the red poppy is a widely recognised emblem. Millions of poppies were sold last year and the appeal raised £30m for the Royal British Legion's charitable work. But what is the etiquette of wearing one? 1. Should you wear one? The poppy commemorates those who have died in war. The tradition was started by American teacher Moina Bell Michael, who sold silk poppies to friends to raise money for the ex-service community. In 1920 the poppy was proclaimed the national emblem of remembrance in the US, and in the UK, the first poppy day was in 1921. Last year Britons bought 26m poppies, but others choose not to. Channel 4 newsreader Jon Snow famously refuses to wear one on air, reportedly saying he does not want to bow to "poppy fascism''. Left for men, right for women? 2. What colour to wear - red, white or purple? Red is most popular, but the lesser-seen white poppy dates from 1933, when the Women's Co-operative Guild wanted a lasting symbol for peace and an end to all wars. But the Royal British Legion refused to be associated with their manufacture, and so the Co-operative Wholesale Society took on production. The intention was not to offend the memory of those who died in the Great War, but many veterans felt white poppies undermined their contribution and the lasting meaning of the red poppy. Feelings ran so high that some women lost their jobs in the 1930s for wearing white poppies. Critics argue the red poppy already encompasses the sentiments of white one, which they say also diverts funds for the Royal British Legion. The Peace Pledge Union, which now distributes the white poppies, estimates that 50,000 were sold in 2006. 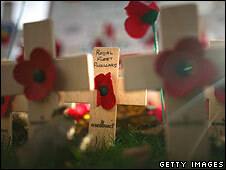 It says the Royal British Legion has been asked twice to manufacture white poppies and has refused on both occasions. A Royal British Legion spokesman says it has no objection to any group expressing its views. 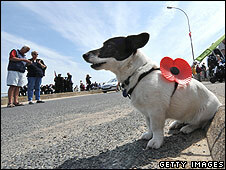 There are also purple poppies, worn to remember the animal victims of war and sold by animal charities. 3. When to start wearing one? It's a hotly debated question. 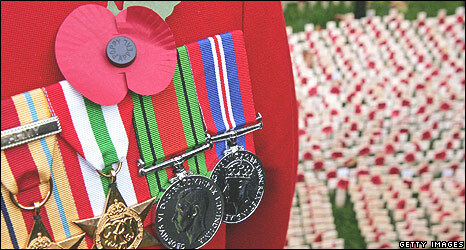 Many people think poppies should be worn from 1 November until Armistice Day on 11 November. Others pin one on only in the week running up to Remembrance Sunday - 8 November this year. The Royal British Legion spokesman says they can be worn from the launch of the poppy appeal, which this year was 22 October. Organisations like the BBC usually choose a day for presenters to start wearing one. This year it was from 6am on 24 October. 4. Where to pin your poppy - left or right. Some people say left, as it's worn over the heart. It is also where military medals are worn. Others say only the Queen and Royal Family are allowed to wear a poppy on the right, which isn't true. Then there is the school of thought that says men should wear theirs on the left and women on the right, as is the traditional custom with a badge or brooch. 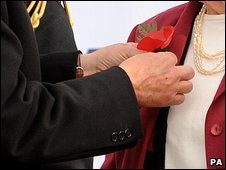 The Royal British Legion spokesman says there is no right or wrong side "other than to wear it with pride". 5. What size should it be? The traditional poppy is roughly 7cm from red tip to the bottom of its green stalk and 4cm wide. But other sizes are worn. 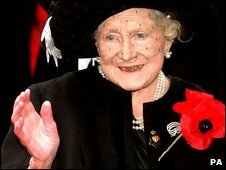 The Queen Mother had an extra large poppy - even two sometimes - specially made for her each year. And Baroness Sayeeda Warsi sported a super-size poppy for last Thursday's controversial Question Time. Why someone wears a larger poppy is open to debate. An attempt to stand out from the crowd, maybe a nonconformist gesture? Whatever the reason, that splash of red certainly gets noticed.